Since travelling to Paris last year on holiday, I have simply fallen in love with all things French. 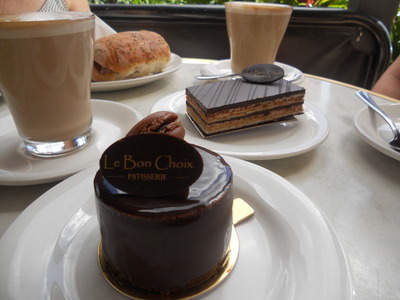 It is to my delight that I have recently discovered Le Bon Choix Bakery on Racecourse Road in Ascot. Everything from the menu to the décor of Le Bon Choix makes you feel almost like you are sitting in a café on the streets of Paris. The menu is filled with classic French pastries and delectable desserts, that look to perfect to eat. If you have a sweet tooth or prefer something savoury, you will not be disappointed. There are traditional croissants, breadsticks, an assortment of Quiche's, Focaccia and Ciabatta sandwiches. Some of the sweet treats which are sure to delight your tastebuds include: Macaroons, Citrus Tart, Lemon Meringue, Tart Aux Fraises (Strawberry Tart) and Chocolate Éclair's just to name a few. The food is very well priced and the service is great. You can choose to sit inside or out, or even take something home for later. It is the perfect spot to indulge the senses for morning tea, lunch or an afternoon treat. Trading hours are from 7am to 6pm daily and open most public holidays. Some desserts can also be made to order for special occasions and catering services are available. Le Bon Choix Bakery is also located on Queen Street. For more details, visit the website and bon appétit!